I'm Mad and I Eat: Where Did Everybody Go? Oh, like you were at Nicole and Keith's wedding! 7. Work during tourist season while trying to deal with visiting relatives in the midst of a family crisis. I wish I were off in Australia...I've been down with a nasty flu-thing. Spent the alleged heat wave in bed. Cool photo. 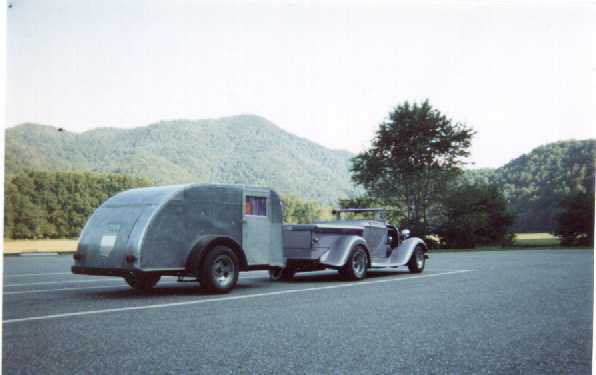 The golden age of road trips? I wasn't at Nicole and Keith's wedding, but I actually was at the second biggest showbiz wedding of the weekend down in LA. It was amazing! Enjoying garden. Watering flowers. Watering flowers to-be. Then grill and relax. Repeat each day until done. Been busy eating out. Saturday was T-Rex. I'm hoping to talk my neighbor into joining me at Cesar tonight. Next Sunday will be Hs Lordship's for their brunch. Also need to talk to my aunt to see when we're heading to Lalime's. So basically I am eating my way through Berkeley. Don't forget to stop by Poulet and try some of Shuna's baked goodies. She won't be there forever, don't miss out. 4. avoiding doing anything because it's 101 degrees outside. ...but at least it's not raining anymore! That panzanella looks fantabulous too! If I could make something that looked like that from the bottom of my refrigerator, I'd be working some serious magic! Cranky and Beansprout are lucky! And hey...did Cranky ever start his own blog?? 1. Family from out of town, visiting for daughter's graduation. 2. Taking care of a boy. 5. Dealing with car in shop. 6. Writing and researching and networking. OMG, you poor people are really smacked! John, I'll have to do some Googling. What fun. Tana, congratulations to your talented and deserving daughter. Have a blast. Michelle: Yeah, it's called A Cunning Trap (see my blogroll). Thanks for compliments... we've got a Fruit-Based panzanella coming up!! I read everyone else's comments and I felt bad. I am still working -- two parttime jobs. It's just that turning 40 and the festivities (eating) that come with it have managed to eclipse everything else in my life. Probably will continue to do so for at least a month, perhaps two. I guess it also helps that I don't really care that much about one of my jobs. Being here, planning to go there, then coming back to be here again. the above being and going person was jen's mom...not "anonymous." Whoops, see what overworking has done? I meant "I'm Mad and I Eat." Unfortunately I was killed in a drive-by shooting over the weekend. Services are still being arranged. Well, see. Everybody's been busy. Except for Kevin. Boy, he'll do anything to get out of work.